Gmail launched four new experimental features in Gmail Labs that show previews for some of the links included in an email. 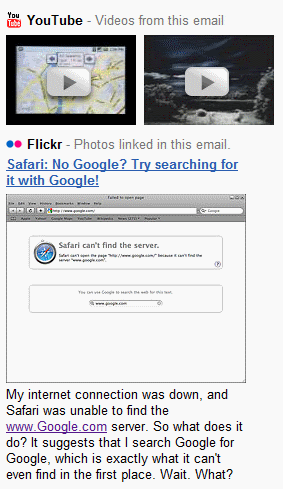 For now, Google supports YouTube videos, images from Flickr and Picasa Web Albums and Yelp reviews. Here’s an example: if you receive a message that includes links to YouTube videos and Flickr images, you’ll see a list of previews below the message. “Gmail currently automatically detects package tracking information, addresses, and event information and shows quick links to delivery status, maps and directions, and Google Calendar. So why couldn’t Gmail automatically detect links in emails and show videos, photos, and ratings right inside these messages as well?” asks the Gmail blog. While the previews are useful, placing them below the message is unfortunate. A Firefox extension like Interclue does a better job at showing smart previews for many other kinds of content and it’s not limited to Gmail.